Refried beans are so often misunderstood – unless you’ve had great ones, preferably made homemade from dried pintos, OG style. Face it, though, we don’t all have the time to make a from scratch version, heck sometimes we don’t have much more time than it takes to heat up a can of refried beans as a quick side for just about anything Mexican or Southwestern. Here’s my “top-secret method” to take any old can of refried beans and doctor it up into creamy goodness: Canned Refried Beans Restaurant Style. And it takes just minutes. This really is more than a method than a recipe, just a simple little trick or two to fix up those canned beans, smooth them out and add a little richness. It was my friend, Katie, who stayed with me for a while and wasn’t afraid to step up to the stove, that first showed me how she fixed up her refried beans. Thanks, Katie! I think you’re gonna love these as much as I do; it’s simple but transformative! And everyone will notice the difference. She’d toss a bit of butter in a pan, then just dump in the canned beans, and once hot and bubbly, stir in a bit of milk, a little if she wanted them thicker, a bit more for smoother and creamy. That reminded me of an old South of the Border cookbook that had you start with a bit of lard and then add a little crema to their homemade frijoles refritos, and it reminded me, too, of a time way back when, when I’d start out with bacon drippings. A handful of cheese tossed in at the end & stirred in or else melted on top (or both) and you’ll have the loveliest beans to serve as a side or in a quick burrito. All in about two minutes! No one will ever guess these are canned refried beans. I have kind of a personal opinion (if you are a follower, you know I have my opinions, lol! If you’re not, I’d love it if you’d follow me, see the right-hand panel for email, facebook, pinterest or twitter) and I think that refried beans are lovely as is without any additional spice; kind of a plain foil for the rest of the food on the plate. That doesn’t mean you can’t spice up your refries however you’d like. Add a few drops or more of your favorite hot sauce, diced peppers or maybe even a pinto bean spice mix. I happen to have one on my site (isn’t that handy?) my Homemade Mexican Pinto Bean Spice. Start out with 1/2 a teaspoon or so and add more if you’d like. Just be sure to heat it through well so it will lose any “raw” chili flavor. I’m not really brand loyal to most products (hey, I’m frugal!) and unless there’s a huge difference in price, I’ll choose the La Preferida brand. No one is paying me to say that! I also stick with the original or the vegetarian (if I’m feeling a bit healthier) and generally buy them without all the spices or peppers added…just plain ol’ refried beans. This method works with any refried bean, though, any flavor, although the fat and dairy will mellow out the spicy ones a bit. Not that they’re so spicy to begin with; they’re really pretty mild. As far as the fat, use a little butter, bacon fat or lard, whatever suits your style and for the dairy, milk, cream, crema, sour cream and so on all work. Add anywhere from 1/3 to 1/2 a cup of dairy, depending on how thick or how creamy you’d like your beans and then just heat through, stirring often, until all is heated through. 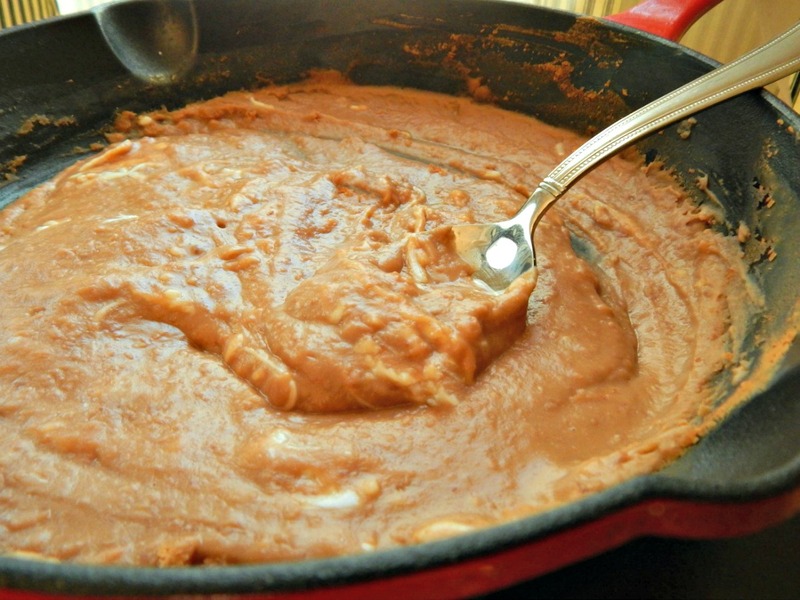 Some brands of refried beans are thicker or thinner to start with, so use your judgment. In my area, a bag of dried beans is always the cheapest option, but even canned refried beans are not going to break the bank. In my area, a can of refried beans is just about the same price as a can of regular old cooked beans. A commenter, below, (thanks C@A) clued me in that the pricing might vary in different areas; if plain old canned beans are less expensive than refried, follow her instructions in the comments to mash up your beans. Just like any pantry “staple”, check for beans on sale, use coupons if you like to, and check the pricing in your grocery aisle that carries items like rice and beans as well as the “ethnic” aisle if your store has one. Stock up when you find really great prices. Beans really are a great source of protein, especially when combined with either corn or rice and they’re a bargain protein as well. They’re a great source of fiber and iron and help stabilize blood sugar – check out what the World’s Healthiest Foods has to say about the lowly Pinto. It’s worth mentioning that the issues so often associated with any beans have a simple solution – just eat more of them! In most cases, your body will get used to them and regulate itself. It sounds too simple to be true, but try it and you’ll be a convert. Add butter, lard or bacon drippings to pan and heat over medium heat. Add in can of refried beans, including any liquid. Stir together. When warmed through, add the dairy and continue to heat, stirring now and then, until desired thickness is reached, a minute or two. This entry was posted in Click here for Fabulous Food Posts and tagged Beans, canned beans, Dried Beans, hearty sides, Mexican or Southwestern, Refried Beans, Side. Bookmark the permalink. It’s so fun to share ideas, isn’t it!! I never would have thought to put it in bean soup!! Great one, Joyce! Want a great bean dip recipe? Do as you describe, add 1/2 pint of homemade salsa or salsa of your choice and then add the cheese. Cannot be beat. Scott Owens. Thanks for your recipe and wait new post form your page!! You’re spending too much money on beans that are already “refried”. Get yourself a can of Pinto or Black beans. In my part of the world, a can of Goya brand costs $0.69 USD. Grab some of your reserved bacon fat (you are saving your bacon fat to use later, right?) and toss a healthy teaspoon into a heavy pan. Heat the bacon fat until it melts and add the entire contents of the can of beans. Using a potato masher, smash up the beans. Add a large pinch of salt and mix the beans around. Stir occasionally over medium heat until beans thicken. So, for about $0.80 you’ve got some delicious and healthy beans. (Just don’t go too crazy with the bacon fat… or substitute vegetable shortening.) Then you can add stuff until your heart is content… I like some shredded cheddar cheese and a bit of sour cream. Yum. Here, they’re about the same price, but this is really just meant to be an “emergency” side – I always have a can or two in my cupboard. But it sounds as if the pricing might vary a bit by area so I’m so glad you stopped by with the suggestion! 🙂 I love hearing helpful comments!! Here a can of refried is at least $1.39. It’ll certainly vary depending on where you are. Wow! I often cook up dried beans and toss them, with the liquid in my freezer – that should be a “soon” post with Cinco de Mayo coming up! I do the same thing – I think bacon fat has become more acceptable since all the paleo type diets have come on board. 🙂 It might be a country thing, too. Thank you for this! I’ve rediscovered a love for refried beans. I like cooking up some bacon and onions first, then mixing in the beans. So frugal, yet so good! There’s that bacon thing! 🙂 So good! I like the onion addition, too. I cannot resist bacon. In any form! I love canned re-fried beans. I especially like the black bean version which I think is a little healthier. Check out my easy Mexican Black Bean Dip. Great use of those little beans. Happy Fiesta Friday!! Thanks! It sounds like you saw this in the nick of time! LOL! It sounds like a fun party! I love this little tip! I’ll definitely have to give it a try next time, thanks for sharing! Sounds like a great way to add flavour to a can. I usually make my own though, in an emergency, I’ll pick up a can. I just came home with a couple of cans of pinto beans which I’m going to have to turn into refried beans … bacon fat? Milk? Seasonings ie cumin? All they had was black bean refried beans but I wasn’t in the mood for that.